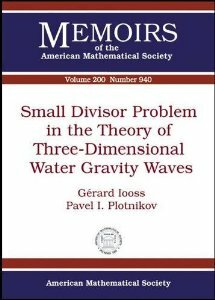 As part of a series of papers on small divisors and the existence of standing and travelling waves, the paper “Asymmetrical three-dimensional travelling waves“, by Gerard Iooss and Pavel Plotnikov, has appeared in the Archives for Rational Mechanics and Analysis. This paper considers waves on infinite depth where the pattern is non-symmetric with respect to the propagation direction of the waves. Defining a pair of amplitudes ε1,ε2 along the basis of wave vectors which satisfy the dispersion relation, they first give the formal asymptotic expansion of bifurcating solutions in powers of ε1,ε2. Then, by using an adapted Nash–Moser theorem, the paper proves the existence of solutions with the above asymptotic expansion for values of the couple (ε21,ε22) in a subset of the first quadrant of the plane with asymptotic full measure at the origin. The ARMA paper can be found here.